Imprisoned Palestinian leader Ahmad Sa'adat will be returning to court in mid-October 2010 challenging his isolation and the isolation of Palestinian political prisoners in Israeli prisons. Write letters today and take action from October 5-15, 2010 in support of Palestinian prisoners' struggle for freedom -- demand an end to isolation! Ahmad Sa'adat, the General Secretary of the Popular Front for the Liberation of Palestine, has been held in isolation in a series of prisons since March 16, 2009, with his isolation renewed again and again by occupation courts. He has been transferred from prison to prison, and is currently held in the isolation section of Ramon prison in the Naqab desert. Within these isolation units, Sa'adat has been placed further inside a separate isolation unit where he is confined without access even to the other prisoners in isolation, and deprived of basic human rights. His personal books have been confiscated and he is allowed access to newspapers only once or twice weekly. He is denied access to English and Arabic language newspapers and allowed only Hebrew-language media. He has been repeatedly denied family visits -- his wife, Abla, has been allowed only two visits during his entire period in isolation -- as well as legal visits, and barred from purchases at the prison canteen, including cigarette purchases. In the prison yard, Sa'adat has been held handcuffed and in ankle shackles and allowed only one-hour of exercise/recreation. The Prison Administration is attempting to criminalize the human and social relationship between fellow Palestinian prisoners, and between the prisoners and their families outside. Sa'adat has led in the struggle against isolation, engaging in a nine-day hunger strike in 2009 in protest of isolation. Isolation is damaging and destructive to the mental and physical health of Palestinian prisoners, and is being used as a political weapon in order to punish and isolate Palestinian prisoner leaders. Some prisoners have been subject to isolation for years at a time, with severe effects. Take action now to fight isolation and demand the freedom of Ahmad Sa'adat and all Palestinian prisoners! You may use our online form at: www.freeahmadsaadat.org/action3.html. 2. Write a letter to Ahmad Sa'adat. Letters of support are important and demonstrate solidarity with Ahmad Sa'adat and Palestinian prisoners -- let him know that the world is demanding his freedom. Email the Campaign to Free Ahmad Sa'adat at info@freeahmadsaadat.org with your letters, or use our contact form at: freeahmadsaadat.org/contact.html. We will send all letters received to Palestine. We also encourage you to write to him directly using this address: Ahmad Sa'adat, Ramon Prison, Ramon area, PO Box 699, Postal Code 80600, Israel. JOIN THE WEEK OF ACTION, OCTOBER 5-15, 2010! 1. 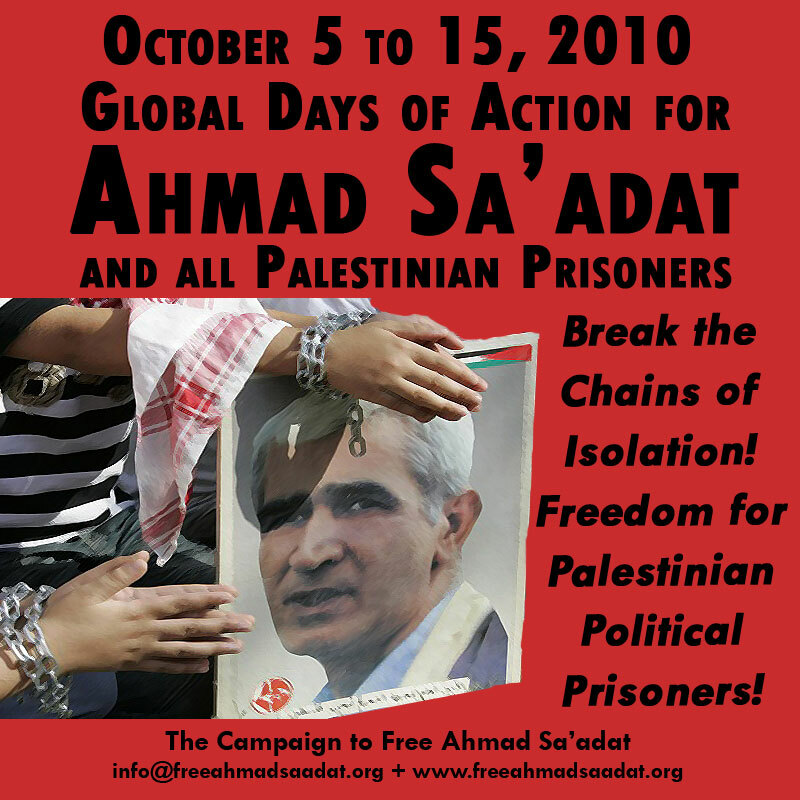 October 5-15, 2010 will be international days of action in support of Ahmad Sa'adat and Palestinian prisoners and against isolation. Join us! Hold an event, protest, or action in your city. Email the Campaign to Free Ahmad Sa'adat at info@freeahmadsaadat.org to be added to the global list of actions. 2. Distribute the Free Ahmad Sa'adat flyer: www.freeahmadsaadat.org/saadat-flyer.pdf in your town, city, event, or location! Bring the flyers to events and activities, or hold a flyer distribution at a public place. Diplomatic+missions/Web+Sites+of+Israeli+Missions+Abroad.htm) and demand the immediate freedom of Ahmad Sa'adat and all Palestinian political prisoners. Ahmad Sa'adat has been imprisoned since 2002 in the prisons of the Palestinian Authority, held under U.S. and British guard, until his abduction by the Israeli occupation forces on March 14, 2006 by an occupation military raid on Jericho prison. On December 25, 2008, he was sentenced to thirty years inside the occupation prisons. He is a member of the Palestinian Legislative Council and one of the foremost Palestinian national leaders held inside the occupier's jails.